George Fox scored just one goal over the weekend, but it was good enough to get the Bruins off to a solid start in the Northwest Conference after a 1-0 win over Pacific and a scoreless draw versus Linfield. 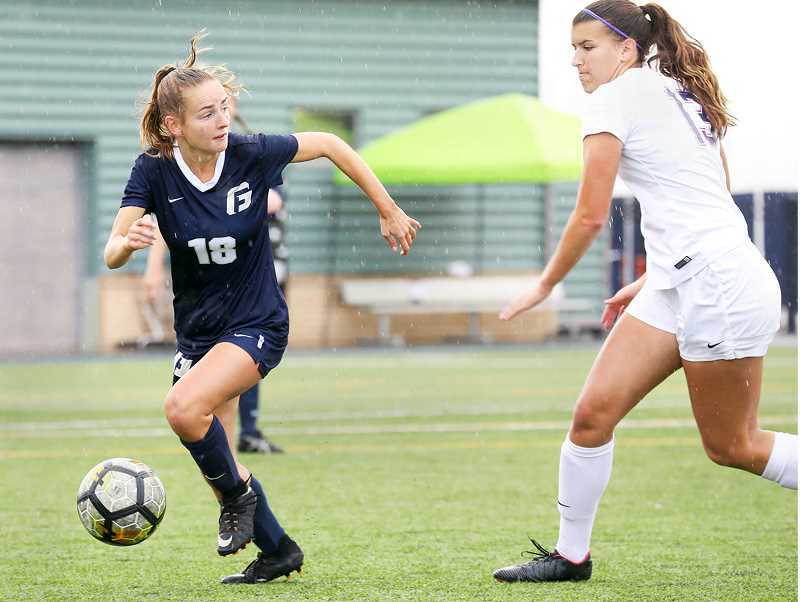 Savannah Moisan scored in the sixth minute and GFU limited the Boxers to just two shots on goal for the game to pick up the win Saturday at the Austin Sports Complex. Brittany Bravo helped create the score by picking off a clearance attempt inside the Pacific Box. She then passed the ball wide to Karlyn Martinez, who crossed it back across the goal mouth, where Moisan headed it home. Moisan had five of George Fox's 11 shots on goal. Annalisa Klein made two saves at the other end to get the shutout. "I was most impressed with the way our girls found their balance and composure today," assistant coach Mariah Fredericks said. "This is a great group and we feel good about our team and the leadership we have that has stepped up on the field." The Bruins put forth another solid defensive effort Sunday versus the Wildcats (3-2, 0-0-2 NWC) , but couldn't breakthrough to find a winner in 90 minutes of regulation and 30 minutes of overtime. George Fox did create several chances in the second overtime period, but shots by Chloe Shoemaker, Daria Brandt and Leanna Harris were saved. The Bruins (3-0, 1-0-1) will return to action at noon Saturday in a home contest versus Pacific Lutheran. George Fox 40, Pomona-Pitzer 6 – The Bruins mounted a shutout in the second half to hand the Sagehens their first loss of the season Saturday in California. George Fox intercepted four passes, with Daniel Campos returning his for a touchdown to open the scoring. Quarterback Jaden Sheffey led a balanced attack, going six-for-eight for 95 yards and rushing for 101 yards and three touchdowns. George Fox (2-1) has a bye this weekend and will play at Pacific Sept. 29. Cal Lutheran Invite – The Bruins opened the tournament Monday with a 1-over-par 289 team score, putting them 11 strokes behind frontrunner Claremont (277). Mason Koch paced George Fox and matched the school's single-round record with a 4-under 68 and was tied for second entering Tuesday's final round (results unavailable at press time). Dante Heitschmidt had an impressive debut, carding a 69 that left him in a tie for fifth. Pacific 3, George Fox 1 – The Boxers got off to a fast start with a 25-8 win in the opening set Sept. 12. After falling 25-21 in the second, the Bruins won the third 25-22, but Pacific (7-4, 1-1 NWC) closed out the match by taking the fourth 25-15. Puget Sound 3, George Fox 2 – The Loggers won the back-and-forth affair 25-22, 22-25, 23-25, 25-15, 17-15 Saturday in Newberg. Laney Search exploded for 12 kills, 34 assists and 10 digs in a rare volleyball triple-double. Whitworth 4, George Fox 0 – The visiting Pirates exploded for three goals in the second half Saturday at the Austin Sports Complex. Whitman 2, George Fox 0 -- Eric Nielsen and CJ Fritz scored first-half goals to lift the Blues to a road win Sunday. The Bruins (1-5, 0-2 NWC) will play at Willamette Saturday.